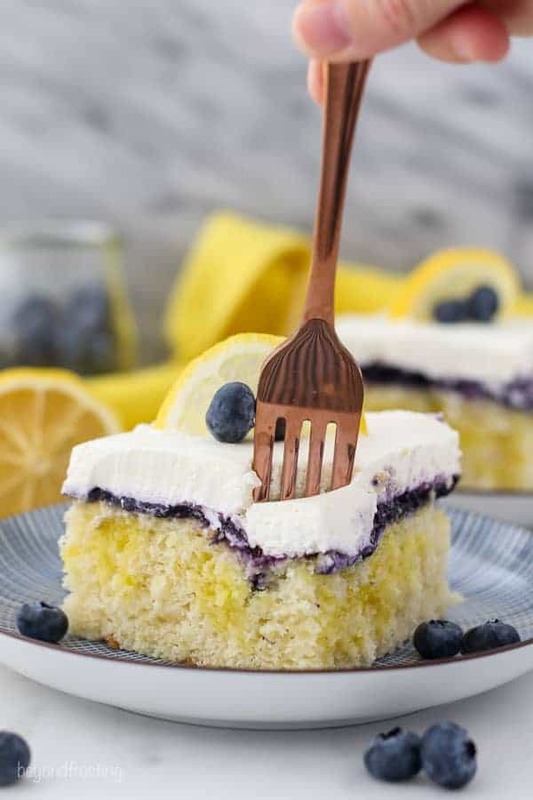 This Lemon Blueberry Poke Cake is a homemade, moist lemon buttermilk cake filled with a lemon pudding, a layer of fresh blueberry sauce and topped with mascarpone whipped cream. 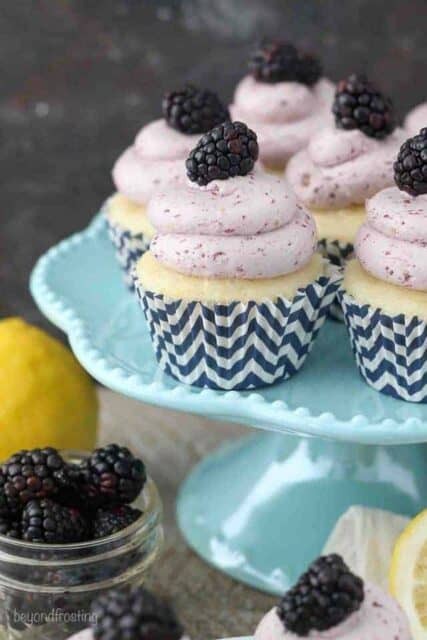 The combination of tart lemon flavor and sweetened blueberries is so refreshing and tasty. 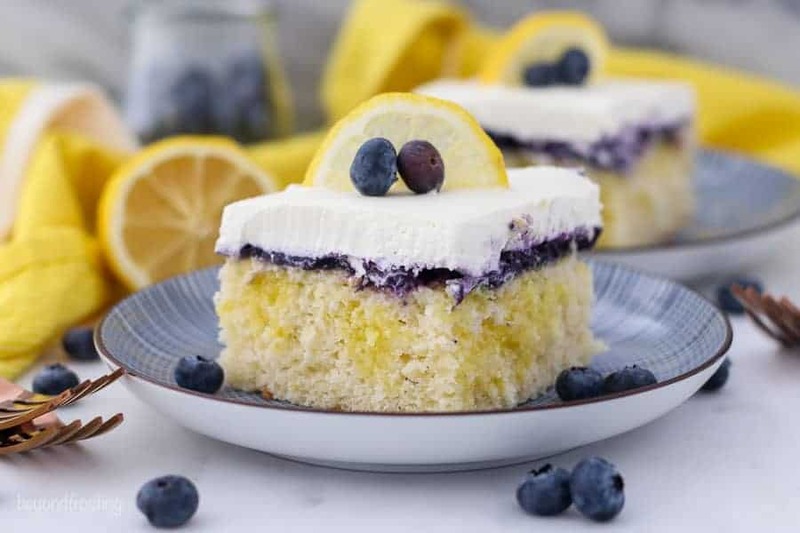 For years, readers who made my blueberry cheesecake poke cake told me they had substituted the vanilla pudding for lemon pudding. 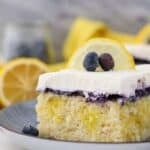 Well I am finally delivering to you a true Lemon Blueberry Poke Cake. 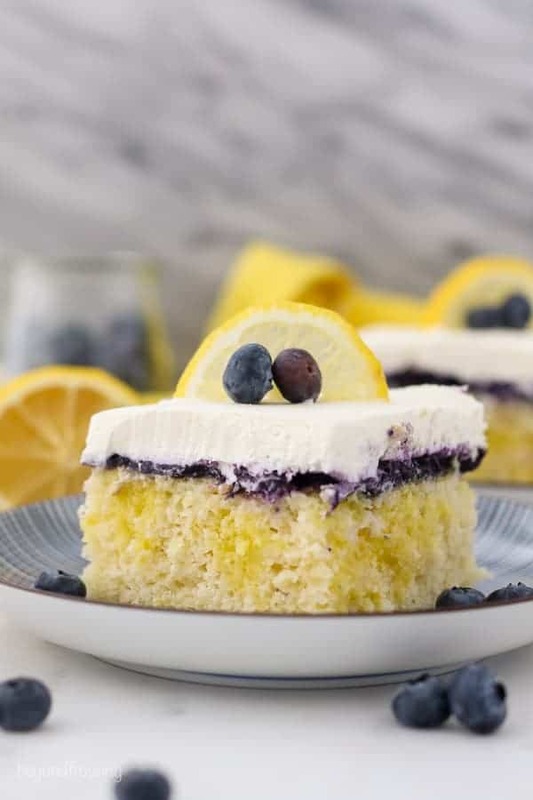 This is a moist lemon buttermilk cake with a lemon pudding filling, a layer of fresh blueberry sauce and a mascarpone whipped cream on top. 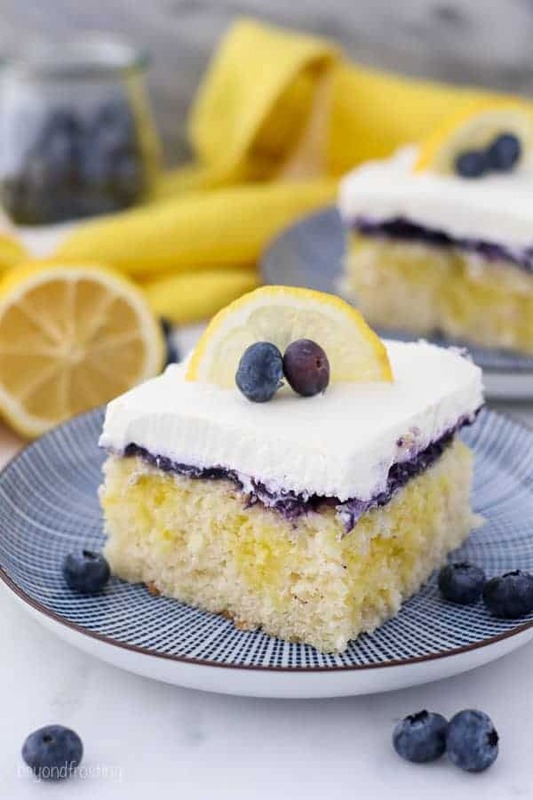 It’s bursting with tart lemon flavor and sweetened blueberries. Recipes like this are super adaptable. 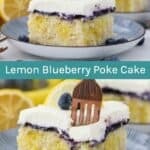 I took the same recipe that I used for my Lemon Cupcake Recipe, and then combined it with the blueberry sauce from my blueberry cheesecake poke cake. You can really swap out the pudding with any flavor you like, but the lemon pudding really helps bring out the flavors in the lemon cake. Then you need to decide on the topping. I picked a mascarpone whipped cream, because it’s not overly sweet but just gives a subtle flavor, allowing the blueberries and lemons to really shine. 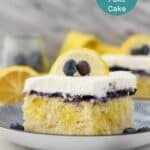 You could certainly use a regular whipped cream or even a cream cheese whipped cream like I did on the original blueberry cheesecake poke cake. Poke cake recipes are a staple on my blog, I think I have over 40 different varieties. They are such a versatile dessert because the flavor options are endless. 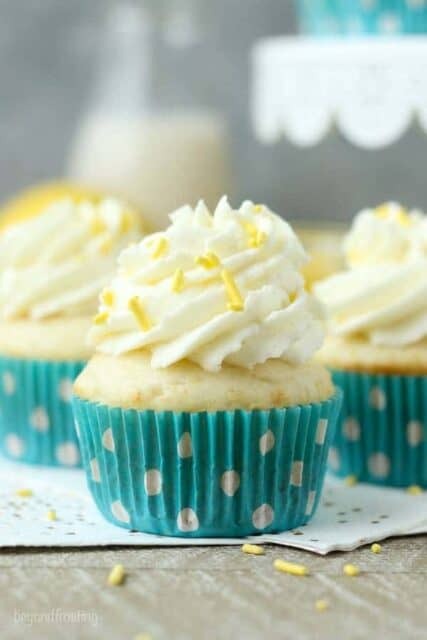 I chose to make this recipe from scratch, but you could certainly use a lemon cake mix for the cake portion. What if you don’t have buttermilk? No problem. Simply take a 1 cup measuring cup, add 1 tablespoon of lemon juice (or white vinegar) and then fill the remaining cup with milk. Allow this to sit for a few minutes before adding it to your baked goods. 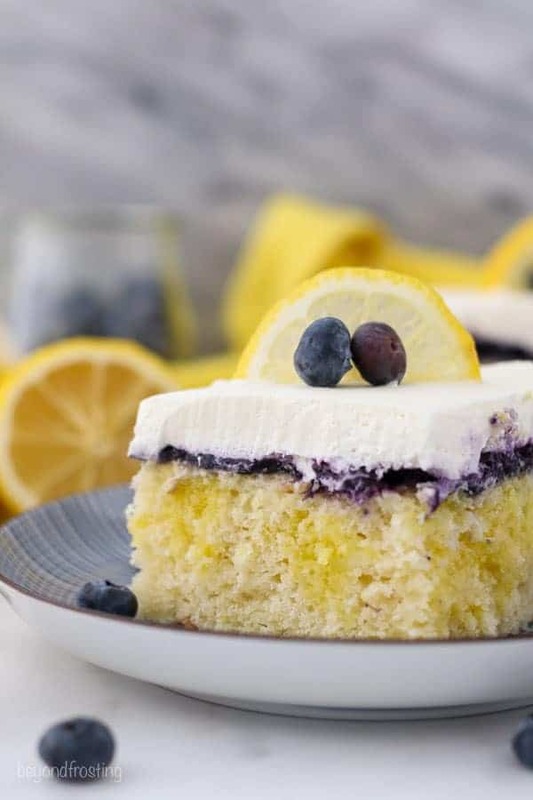 It might seem like there’s a lot of steps to make this Lemon Blueberry Poke Cake, but while the cake is baking, you can prepare the blueberry filling and once the cake is cooled a bit, your filling will be ready to go. When poking the holes in the cake, be sure they are wide enough for the pudding soak into. Pour the pudding over the cake when it’s still in the liquid form. This means mixing your milk into the dry pudding mix only until it’s dissolved and then immediately pouring it over the cake. You can even use a spatula to move some of the pudding around to fill in those holes. 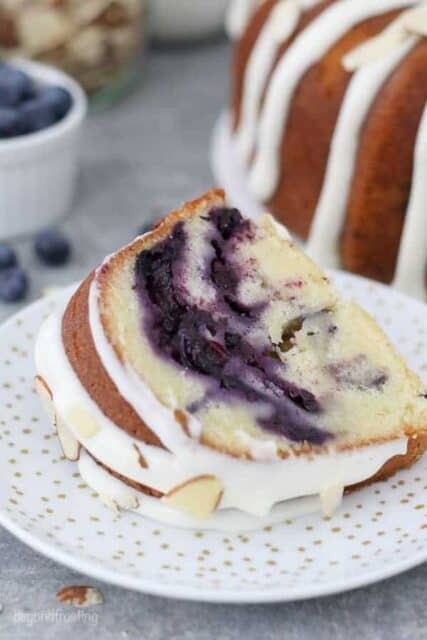 It’s important to refrigerate the cake for 10 minutes or so, allowing the pudding to set before attempting to spread the blueberry sauce over top. Throw the cake back in the fridge and then allow it to cool completely before adding the whipped cream topping. All these flavors combined are so refreshing together! 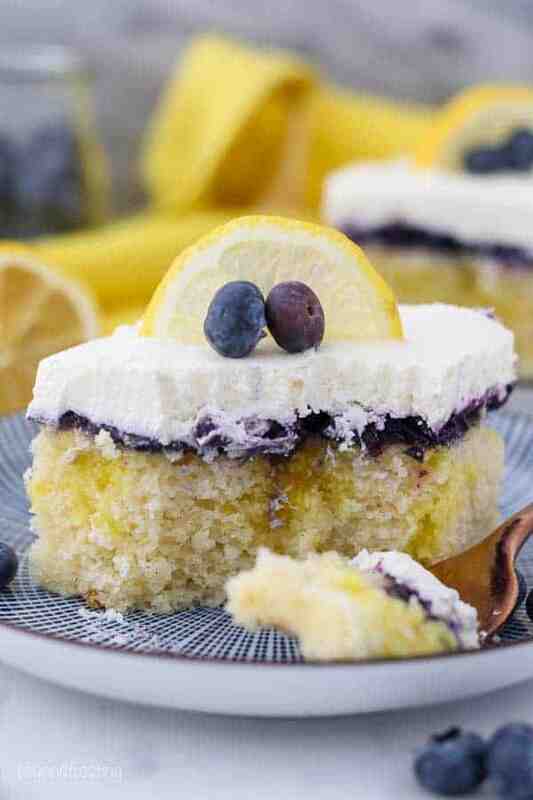 If you love the combination of lemon and blueberry, you’ll also love my Blueberry Lemon Mascarpone Layer Cake. For the cake: Preheat the oven to 350°F. In a large mixing bowl, combine the sugar, vegetable oil, eggs and lemon extract. Beat on medium speed until the eggs and oil are well incorporated and the batter is lighter in color, about 2 minutes. Scrape down the bowl as needed. Next, add the lemon zest and the sour cream and beat until well combined. Combine the dry ingredients in a separate bowl. Add half the dry ingredients followed by the lemon juice and half the buttermilk and mix just until the flour starts to incorporate. Finally add the remaining dry ingredients and buttermilk and beat until all of the ingredients are well combined. Use a spatula to scrape down the sides of the bowl and stir the batter from the bottom to the top to ensure it’s well mixed. Pour the batter into a 9×13-inch pan and bake at 350°F for 28-32 minutes. Test the cake for doneness by inserting a toothpick into the center of the cake. If the toothpick comes out clean, your cake is done. Remove from the oven and allow to cool completely. For the blueberry sauce: Start by rinsing the berries. In a medium-sized sauce pan, combine blueberries, sugar, flour and water; stir well. Cook over medium-high heat until mixture starts to bubble, stirring often. Turn down heat and let simmer to allow the blueberries to soften. Cook until sauce thickens; around 10-15 minutes. Stir often so the bottom does not burn. Allow to cool for 20 minutes, refrigerate if necessary. While the cake is still warm, take the end of a wooden spoon or another round object and poke holes all over the top of your cake. Allow to cool for another 20 minutes. For the pudding filling: by combining lemon pudding with milk and whisk until the pudding is dissolved. Pour pudding over top of cake, filling the holes. Refrigerate at least 10 minutes until the pudding is firm. Pour blueberry sauce over top of the pudding and refrigerate until cake and toppings are cooled. For the frosting: Place the mixing bowl and whisk attachment in the freezer for 5 to 10 minutes to chill. Pour the heavy whipping cream into the chilled bowl and use an electric mixer to beat the heavy cream on medium-high speed until the cream starts to thicken. Slowly add the powdered sugar, vanilla extract and lemon zest and continue beating on high speed until soft peaks form. Next, spoon the mascarpone into the bowl and continue beating at a high speed until stiff peaks form. Spread over top of cake, be sure the cake is completely cooled before spreading the whipped cream on top. It looks delicious, pretty and easy. I will definitely try this recipe to my daughter birthday. Awesome! I hope you like it.